The Thiru Paarthanpalli Temple is situated near Seerkazhi in Thanjavur District, Tamil Nadu. The deity of this temple is Lord Thamaraiyal Kelvan (Vishnu). The deity is also known by the name Lakshmi Rangar. The idol is in a standing position facing towards the east. There is a separate idol of the deity known by the name ‘Kolavalli Raman’ which is meant to be taken out of the temple in procession during festivals. This deity has a shell, a discus, a weapon, a bow and arrow in his hands. Every year during the Tamil month ‘Thai’, on a day called ‘Pushya Natchatiram’, a function of the Pushkarini (temple teertham) is celebrated. Access to the temple About two miles from Thirunangoor. About two miles from Thiruvankaadu. The Moolavar of this Divyadesam is Thamaraiyal Kelvan. Also known as Lakshmi Rangar. He is giving his seva Nindra (Standing) Thirukkolam facing his thirumugham towards east direction. 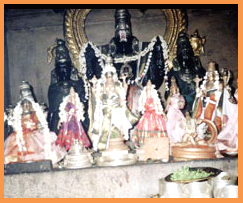 Prathyaksham for Parthan, Varunan and Ekadasa Rudhirar. This temple lies near Thiruvennkadu of Tanjore district in Tamil Nadu. It's about 7 kms away from Seerkazhi and 2kms away from Thiruvennkadu.